Cut Little Things With Speed And Precision. Food Prep Made Easy! Slice mushrooms for a pizza, or chop berries for jam. This specialized food holder works with smaller fruits and vegetables to make it possible to cut them quickly with a mandoline slicer. It's designed for use with our Stainless Steel V-Slicer, but it also works on the Borner models we carry, and any other one that isn't too wide. Rounded sides will curve around the exterior of the slicer frame, and your food will fit securely, up inside the container. The see-through chamber provides ample room, and a spiked plunger above it, allows you to direct food downward to keep slicing right to the last bit. Fruits and veggies will press flush with the blades, and you fingers will remain at a safe distance. Instead of struggling with metal prongs and other mechanisms that aren't compatible with tiny stuff, you will have a safe and frustration-free method of holding food while you cut it. Use in conjunction with any compatible slicing tool to speed through food prep while keeping your knife in the drawer. You can also use it to make certain large foods easier to handle. Just portion them down, and stick the pieces inside. Any larger food that causes trouble with other holders. Designed to fit snugly, but still allow movement, this holder is perfectly sized for our Stainless Steel V-Slicer. The arms wrap around the side of the frame to sort of clip it in place, and it slides easily, up and down the face of the slicer. On other tools it may fit more loosely, or a bit more tight, but as long as the slicer is not too wide, it should be compatible. You need the bottom red part to rest flush with the cutting surface, but positioning of the arms is less critical. 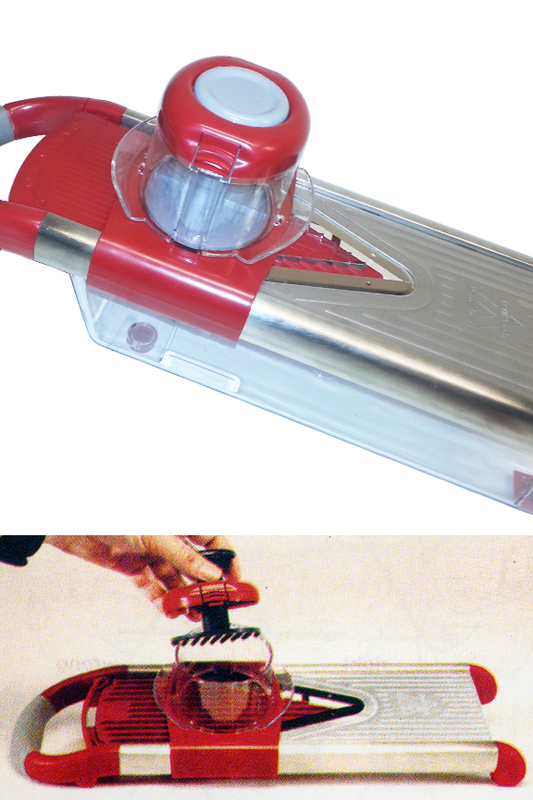 Once in place, it will press down any number of pieces to make the come in contact with the blade. In this way, tiny foods that you normally need to cut by hand, can be easily sliced using a faster, more accurate method. To use it, clip or set in place. Ensure that you have the correct blade installed. 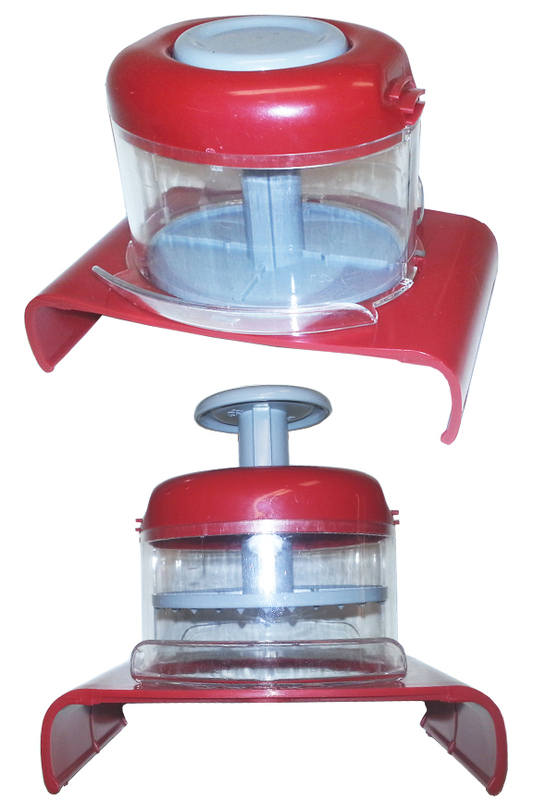 Release and take off the red lid at the top by pressing the buttons on the sides, and then lifting up. Once the top is open, load in your fruits or vegetables. It can hold several whole mushrooms at once. You can also chop up larger foods like carrots, and put them in, to make them easier to hold. Once the chamber is full, replace the lid, and press down to secure with a click. The gray plunger at the center will help you control food, and press it down against the blade. Hold using your whole hand over the top, and slice using a back and forth motion. Reload as needed by repeating the steps above. Container Dimensions 3.75" x 2.75"
Uses For cutting small fruits and vegetables with a mandoline slicer. Compatibility Designed for use with our Stainless Steel V-Slicer, but also works with the Borner V-Slicer Plus, V-Power and others. Slicer width will determine compatibility. Slice small stuff with speed and precision. It's easy to cut berries, mushrooms, garlic and other little foods when you have this accessory. Order Yours Today!